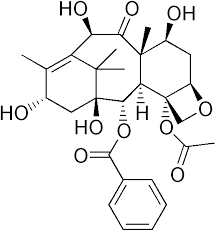 10-Deacetylbaccatins (10 DAB) are a series of closely related natural organic compounds isolated from the yew tree (Genera Taxus). 10-DAB is also isolated from the needles (leaves) and roots of the Canadian Yew tree, Taxus canadensis, the American ornamental Yew Tree, Taxus media “hicksii” or the European Yew Tree, Taxus baccata, utilizing patented Super Fluid CXP technology [Castor, US Patent] followed by segmentation chromatography. 10-DAB is used as the core starting material in the semi-synthetic manufacturing of Paclitaxel and Docetaxel, a potent anticancer compound. Initial silica chromatography separates oils and polar components from hyperforin and adhyperforin. Then C18 chromatography is used to separate hyperforin and adhyperforin. 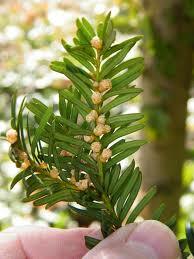 Taxol is mainly produced by yew trees. With an extremely low content, its concentration ranges from 0 to 0.069% (tree material dry weight), with the highest percentage found in the bark. Therefore, at the early stage of drug development, the destructive collection of bark for Taxol threatened wild resources and was ultimately prohibited around the world. 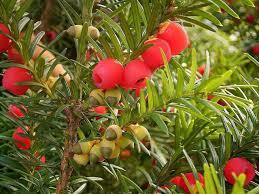 For example, all Taxus species were under the Grade I national protection in the National Key Protected Wild Plants List (1999) published by the Chinese government (http://www.gov.cn/gongbao/content/2000/content_60072.htm). T. wallichiana was also listed on Appendix II of the Convention on International Trade in Endangered Species of Wild Fauna and Flora (CITES) in 1995, and afterwards other Taxus species, such as T. chinensis and T. cuspidata, were added to the Appendix II. Consequently, alternative Taxol sources have been explored to meet increasing clinical requirements. Currently, Taxol produced from seedling culture, forestation of yew trees and chemical semi-synthesis of Taxol from the precursor 10-deacetylbaccatin III (10-DAB) have become the major Taxol sources for clinical supply. 10-DAB is also one of the key intermediates in the biosynthetic pathway of Taxol and is converted into baccatin III by the enzyme 10-deacetylbaccatin III-10-O-acetyltransferase (DBAT). 10-deacetylbaccatin III is an intermediate in the biosynthetic pathway of the taxane, paclitaxel. Taxanes disrupt mitosis by preventing microtubule destabilization and spindle fiber formation in animal cells (Molè-Bajer, 1983). Taxanes are currently being investigated as possible treatment for certain cancers, and paclitaxel, is currently approved by the FDA for treatment of AIDS-related Karposi sarcoma, breast cancer, non-small cell lung cancer, and ovarian cancer (National Cancer Institute, 2012). 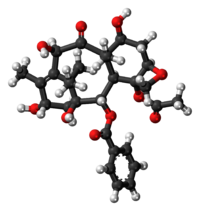 Compact and informative article, unknown and useful information about known molecule.